GHOST with smartphone creates super flying experience. One-click commands of UNLOCK, TAKEOFF, RETURN made simple and smart. 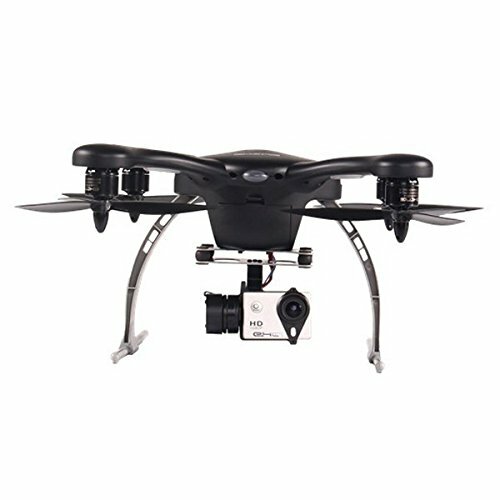 The GHOST Aerial comes with a Gimbal so you can take amazing aerial shots. The Gimbal fits all editions of the GoPro and other similar size cameras, and includes an auto-levelling function to ensure smooth and stabilized images. FLY · EXPLORE · FILM – Everything you need to start your filming adventure. Perfect for first-timers and experienced pilots alike. • Easy to control: Control height and orientation through the APP by sliding bars, and the rest is taken care of. • LIVE Data Sync: Within 1000m of communication distance, flight data is displayed in the app to show the drone’s condition. Inspire to Film, Easier to control then a Parrot Bebop, and cost less then a DJI Phantom! what more you can ask for!